Travelers comes to Vlore County to enjoy the excellent beach resorts in the capital, Vlore City, and elsewhere, and to explore the fascinating ruins of the ancient cities of Butrint in Sarande. Vlore City, or Vlora, is a bustling port city on the Adriatic coast. Known as Aulon in ancient times, it is one of Albania's oldest cities. Vlore has seen much political upheaval. It was independent Albania's first capital in 1920, was bombed heavily during World War II, was an important recruiting centre for the Surigumi (secret police) under Hoxha's communism, and the centre of riots when the country almost dissolved into civil war in 1997. It is an industrial city, the country's second largest port city, after Durres. Vlore's palm-lined streets have recently been expanded towards the shore, giving the city the reputation of the "Albanian Riviera". Tourists are attracted by its fine beaches, and there are many hotels and recreational centres. Old Vlore is rapidly turning into a new, modern city. Although there are several museums in the city, there really aren't too many other tourist sites in the area. The most significant are the medieval castle of Kanine, and the renaissance Mosque of Muradie. 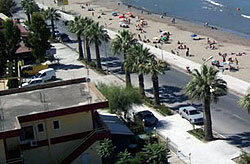 The city is also a good base for travel to nearby Sarande. Vlore is experiencing a building rush with hotels, shopping centres, and residential buildings going up. Some have been built haphazardly, or were never finished. Sarande City. Vlore's main boulevard leads to the mountain passes, secluded beaches, and the rolling scenery of several Greek-styled villages, that eventually lead you to the charming town of Sarande (also known as Saranda). Sarande has always been popular with Albanian newlyweds. Known for its romantic, rustic Mediterranean atmosphere, it is nicknamed Albania's "Honeymoon City". The nearby ruins of Butrint are the city's main attraction. Because of its unspoilt Mediterranean vibe, Conde Nast Traveler has called the city "the next place" in Europe. Cozy hotels, excellent restaurants and cafes dot the Albanian Riviera, which is framed by swaying palm trees and the serene aquatic beauty of the Ionian coast. Perhaps the most lauded among Albania's archaeological finds is the ancient city of Butrint. Largely unknown to the rest of the world, you can still enjoy discovering this important archaeological centre without battling it out with a thousand other tourists. Once inhabited by Greeks, Romans, Byzantines, and Venetians, Butrint was one of the most thriving maritime and commercial centers of the Ancient World. What we see today is only about 15% of the total area. The crumbling temples, amphitheatre, important architectural structures, ancient mosaics, and artifacts have been a UNESCO World Heritage Site since 1992. During the summer, the Russian Bolshoi Theatre performs here. Ksamili After exploring the ancient grandeur of Butrint, travelers continue to explore the beach village of Ksamili. Here there are hotels, and many great seafood restaurants to relax in. Dhermi The English landscape painter Edward Lear described Dhermi it as "more magnificent in its location than any other village I have seen in Acroceraunia and resembles no little Atrani and Amalfi (in Italy)". Dhermi is located in middle of a 5 kilometers long beach that begins in the peninsula of Karaburuni and ends in the hills, above which stands the monastery of Saint Theodore. The village is a beautiful sight, with its characteristically Southern architecture, amidst the traditional Mediterranean greenness. The deep, clean, blue Ionian sea combines with the clear and healthy air of the mountains, protected in the North from wind by the peninsula of Karaburuni. This is the beach resort for Albanians to go - and not for the usual reasons. One beach is amazing and frequently visited by the president and prime minister themselves, but it is particularly hard to find. When taking the road down to Dhermi you have to go right somewhere on a street that doesn't look like one, but is just rocks and sand. After a 10 to 15 minute drive, a magnificent lonely spot opens up and you can have a terrific time at the beach and on the campsite or in one of the few cabins. A recent blogger, Andrew David Nelson, said: "Dhermi is Heaven. Really. Laid back and beautiful, unique and rustic. It makes my top three chill-out locations of all-time (Ilha Grande, Brazil and Olimpos, Turkey round out the list). The water around Dhermi is so clear, you would swear it's fake. I wish I stayed for weeks."